PLASTER ROCK, New Brunswick, Canada, January 8, 2014 (ENS) – A Canadian National Railway train carrying crude oil and propane is still burning after it derailed and broke into flames Tuesday evening near a village in northwestern New Brunswick. Seventeen cars of the 122-car train went off the rails around 7 pm Tuesday in the village of Plaster Rock, about 20 miles east of the border between the Canadian province of New Brunswick and the U.S. state of Maine. 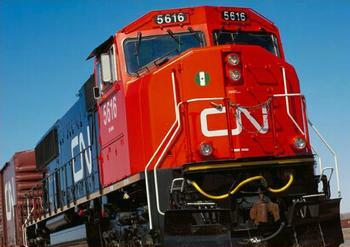 The train was on its way to Moncton, New Brunswick from Toronto, Ontario. The cars on fire include five cars filled with crude oil, four cars carrying liquefied petroleum gas, a locomotive and a hopper car, said a CN spokesman. Volunteer firefighters responding to the derailment faced a large fireball and a giant plume of black smoke. No injuries have been reported in the village of 1,100 people. About 150 people were evacuated to the local community center. CN Rail spokesman Jim Feeny said crews are conducting aerial surveillance by helicopter to get more information about the blaze and any dangers involved before sending crews in to clean up the wreck. The Transportation Safety Board of Canada has deployed a team of investigators to the Plaster Rock derailment site. They have found that mechanical failure was responsible for the derailment. Transportation Safety Board official Dan Holbrook told CBC Radio’s Maritime Noon that the train experienced an “undesired brake application” as a result of a break in the airline through the train, which caused the brakes to go into emergency mode. “Trains have a continuous pipe running throughout the train that supplies air to the brake system on every car,” said Holbrook. Oil and gas pipelines are operating at full capacity and approvals of new pipelines across Canada and the United States have been delayed by environmental controversy, so petroleum producers are increasingly shipping their products by rail. The transport of oil by rail across Canada has been under examination since last July 6, when a train carrying crude oil from North Dakota derailed and exploded in Lac-Mégantic, Quebec, killing 47 people and destroying the town. It was the worst rail accident in Canadian history. Another train carrying crude oil exploded in late December in North Dakota. The train with more than 100 cars of crude oil derailed and exploded in a massive fireball December 30, forcing evacuations. In November, a 90-car oil train derailed in rural Alabama, causing 11 crude tank cars to explode in fireballs similar to those at Lac-Mégantic.